Former U.S. President-wannabe — who lost the election to the most radical Democrat in the nation, Barack Hussein Obama — Arizona’s senior Republican Sen. John McCain confirmed in an excerpt of his upcoming final memoir that he personally handed over the Hillary Clinton campaign-funded dossier filled with salacious accusations against Trump to fired-FBI Director James Comey. 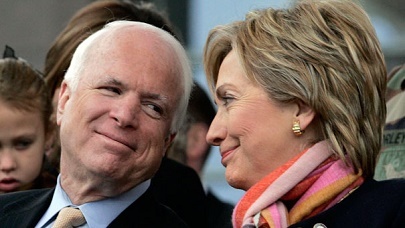 Sen. John McCain (with his dear friend Hillary Clinton) admits — in fact he’s proud of — the fact he turned over the Dirty Dossier to the FBI without verifying its authenticity. While he admits to sending a staffer overseas to obtain an unverified dossier about President Trump, he appears to be proud of his role in creating a scandal regarding Trump and some of his compaign and transition staff for the ex-FBI Director James Comey. 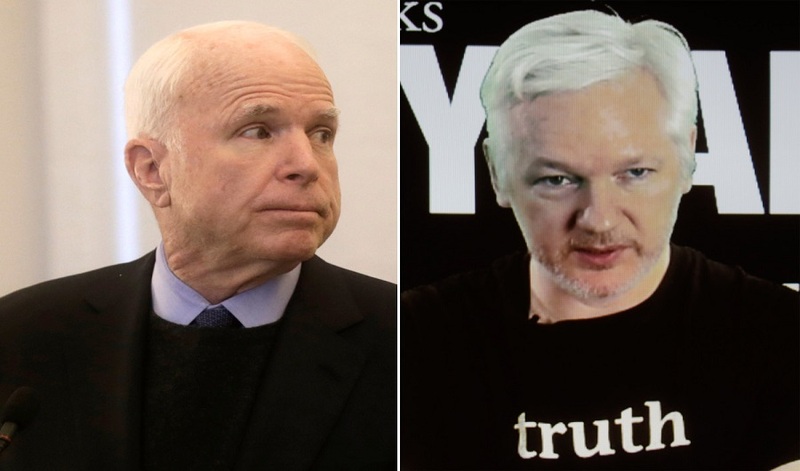 A former intelligence officer told the Conservative Base that the left-leaning British newspaper, The Guardian, described how the dossier came to be and how McCain got his hands on the super-secret documents. McCain writes that in November 2016, he spoke with Sir Andrew Wood, a former British diplomat, at the Halifax International Security Forum. Wood alerted him to Steele’s work after which, David Kramer, senior director for Human Rights and Human Freedoms at the McCain Institute, traveled to London to meet with Steele. Prior to this, as The Washington Post reported, Steele had already met with American officials in Rome to discuss his findings. The Arizona Republican had previously issued a statement in January of 2017 about passing over “sensitive information” to Comey. McCain recounts how he put the dossier in a safe in his office and called Comey’s office to request a meeting: “I went to see him at his earliest convenience, handed him the dossier, explained how it had come into my possession. It appears the decision by McCain to deliver the dossier to Comey got the Russia investigation rolling. McCain, for his part, does not have any regrets. “I first heard about this mysterious dossier when I was checking out an Inside the Beltway private detective and security firm. The firm allegedly tapped Trump‘s campaign staff and his allies hoping to find negative ammunition against the true Republican Maverick, Donald Trump,” said former military intelligence operative and New York police detective Michael Snopes.